Canon's New PowerShot SX230 HS – Lotsa Zoom And Built-in GPS | OhGizmo! By Andrew Liszewski on 02/07/11 • Leave a comment! Canon unveiled a huge pile of new toys today including 4 new PowerShot models, with the SX230 HS being the most drool-worthy. All of the models include Canon’s proven HS SYSTEM which uses their DIGIC 4 image processor and a high-sensitivity 12.1MP CMOS sensor to reduce noise in photos taken in dark situations, so you don’t necessarily have to always resort to washing everything out with the built-in flash. It’s also got a 28mm equivalent lens with 14X optical zoom and optical image stabilization to keep blurs to a minimum when zoomed all the way in. It’s also one of Canon’s first P&S cameras to come with a built-in GPS receiver that continually tracks the user’s location and records the latitude, longitude and altitude of where a pic was taken in its EXIF data. The receiver will even keep working when the camera is off, so the camera then doubles as a GPS logger, tracking the user’s adventures wherever they may roam. And since sometimes 1,000 words isn’t enough to capture a moment, the SX230 HS also captures full 1080P video at 24fps, or 720P at 30fps. Or drop the resolution to 320×240 where you can then capture high-speed footage at up to 240fps. 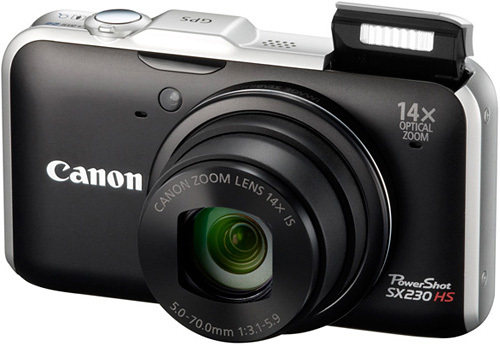 The Canon PowerShot SX230 HS will be available near the end of March with an expected MSRP of $349.99.